Shopkeeper by day, dungeon explorer by night. What started off as a simple Kickstarter project quickly became a huge success. Supported by 5.229 backers (or financial supporters) the adventurous action RPG Moonlighter came to life. If you like combining fighting and thinking in a game, then you might just enjoy this one. 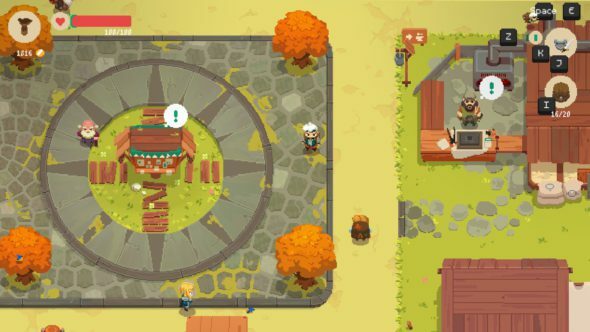 We can also say this is a glorious day for Digital Sun Games who developed its first full game with Moonlighter, bull’s-eye! 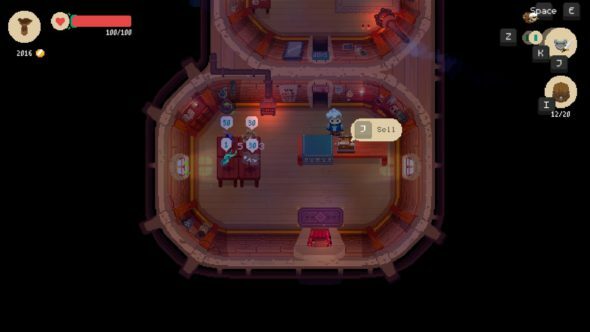 In Moonlighter you play as Will, an adventurous shopkeeper who dreams of being a hero. Will lives in Rynoka, a small and quiet village. On the one hand you go dungeon exploring just outside of your hometown. Next to defeating various monsters showing up here you have to retrieve items to bring back home. On the other hand you have to make a living, obviously. This can be done by opening your shop during the day and selling the loot you brought back from the dungeons. These profits can then be used to upgrade your shop, buy new weapons and armor or attract new vendors to your town. The game finds a perfect balance between battling and marketing, making sure there is never a dull moment. There is no leveling and no rush so you can play out the story at your own pace. Moonlighter has a pixel art style with a lot of detail and color. Upon first playing, it immediately reminds of the popular game The Legend of Zelda. It also seems to harbor elements of the country-life RPG Stardew Valley. 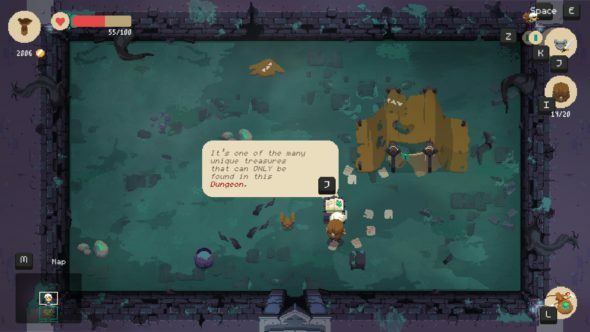 The dungeons generated in Moonlighter suggest influences of The Binding of Isaac. We can continue going down this path but to wrap it up: the game found a lot of its inspirations in other games yet it still manages to create its own beautiful content creating a game with highly satisfying graphics. Music fitting the adorable pixel art style is provided throughout the game. Relaxing music plays while you manage your shop, making the activity even more enjoyable. Add some calm tunes for when you’re walking through town interacting with other NPCs and some adventurous music to enjoy while exploring and looting dungeons and you have a delightful palette of sounds. The music was written by Alec Holowka, a musician who has already contributed to various indie titles such as Aquaria and TowerFall Ascension. 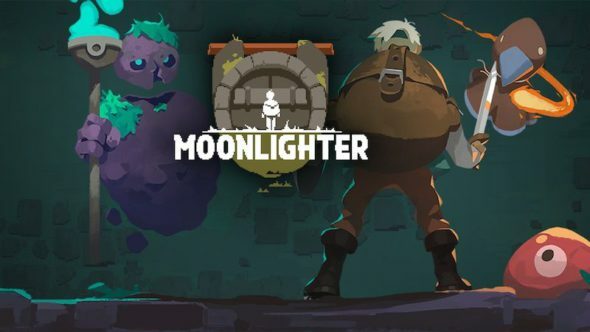 Moonlighter is a single player action RPG game with rogue-lite elements. The game can played by using a gamepad or keyboard, there is no mouse support anywhere in the game. As mentioned above, the game has a dual nature with the shop keeping during the day and the battling during the night. Near the town of Rynoka you can find the Gates, an excavation attracting adventurers. This is where you go to explore the various and dangerous Realms. A mix of creatures lives in the randomly generated dungeons which drop loot upon killing them. At the end of each Realm there is a boss waiting to be defeated. If you decide you’ve had enough of the dungeons for the night, you can use a pendant to transport you back to town. This isn’t free of charge though. If you don’t have enough money there is always the option of using the mirror to sell items you carry around while still being in the dungeons. If you happen to be killed during one of your adventurous walks, you won’t really die. You’ll just be kicked out of the dungeons and lose most of the items you carry. You can then choose to try again or go home. Another challenge provided by the game while dungeon looting is managing your inventory. First of all there is the limited inventory space. Secondly, some items tend to have special ‘wishes’. For example some items can only be kept at the right side of your inventory or only on the bottom half. Third, items can have random secondary effects that can affect Will. Learning what to keep and what to sell is key. Now in order to defeat stronger monsters, you yourself have to become a stronger warrior. This can be done by upgrading your armor and buying more powerful weapons. 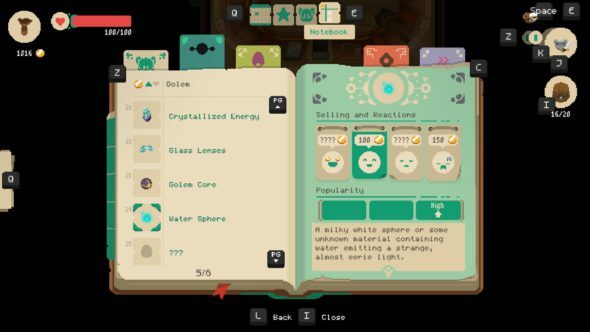 Moonlighter offers different kinds of weapons, including swords, bows and spears. Each of these weapons has a basic attack and a special attack. Of course, money is needed in order to buy stronger armor/weapons. This is where the shop keeping comes into play. During the day, you sell the items you retrieved in the dungeons. Customers visiting your shop will react to the items you put up for sale. This gives you an indication as to whether the item you’re selling is too expensive, too cheap or priced just right. Information about the items you find and sell is stored inside a notebook Will carries around with him at all times. Paying attention is important since customers might get impatient if they have to wait too long at the checkout or some might even try to shoplift. Some customers request special items which you can then try to retrieve from the dungeons, resulting in good profits. The money you earn but don’t use to upgrade your armor or buy better weapons can also be used to upgrade your shop. You can for example hire someone to open up the shop for you. This way you can also loot dungeons during the day. Or you can add more storage, since at the start you can only sell four items at a time. Gold can also be put to good use in another way, namely by investing in other businesses or NPCs. At the beginning of the game you are the only shop in town. Investing in other shops will attract them to Rynoka and you can help improve them. Digital Sun Games definitely started off with a great game to introduce as their first full game. After playing the game for several hours, you understand why the Kickstarter project was such a success. The elements of shopkeeping and battling are put together in an amazing way which creates a new game experience unlike any other games in its genre. When looking at the gameplay, music and graphics, it all just fits perfectly and the big picture looks amazing. The only thing that sometimes bothers you is that there is zero mouse support; you have to use a controller or keyboard. Overall the game is very enjoyable. Hopefully, the developers with continue to update and upgrade the world of Will since the game still has a lot of potential.